Denzel Washington gives an impressive performance as the schlubby, socially awkward, but earnest and gifted lawyer in this social drama. As the film opens, Roman's long-time legal partner has fallen into a coma, forcing Roman to confront the morally messy reality of the law-firm he has spent his life in, and to accept a job with the slick corporate lawyer George Pierce (Colin Farrell). One expects the plot to revolve around the moral tension between the two men. Roman is a veteran civil rights lawyer who wants to file a class action lawsuit to end plea bargains that compromise his clients' civil rights, landing them in prison to apparently save on legal costs. Pierce wants him to do paying work and make money. But actually it's really about the inner fight within Roman - between his old idealism, and the reality that he now has to confront, and whether he will give into that new cynicism. What I love about this film is its lack of flash. Even the Colin Farrell character, while slick, isn't a caricature Wall Street style guy - he does actually want to do what's right without going bankrupt. And the way in which writer-director Dan Gilroy (NIGHTCRAWLER) and his DP film the LA law offices shows them to be messy, cramped, with a camera that sneaks up behind people and lingers over their shoulders. Moreover, it's a courtroom drama without a courtroom scene - which I guess is kind of Roman's point - that the general way in which American law operates, people DON'T get their day in court. I also love the way the film so delicately walks the line of creating a quirky, eccentric character, but not allowing him to become a collection of ticks. Roman is genuinely believable, if exaggerated in his look and feel. Moreover, the script allows Roman to be far more morally complex than a mere earnest self-described chivalrous man of old. There's a point at which he makes a decision that is legally and ethically complex and its consequences drive the final act of the film. The result is a drama that is far more adult, nuanced, and perhaps less simply satisfying than the typical fare. 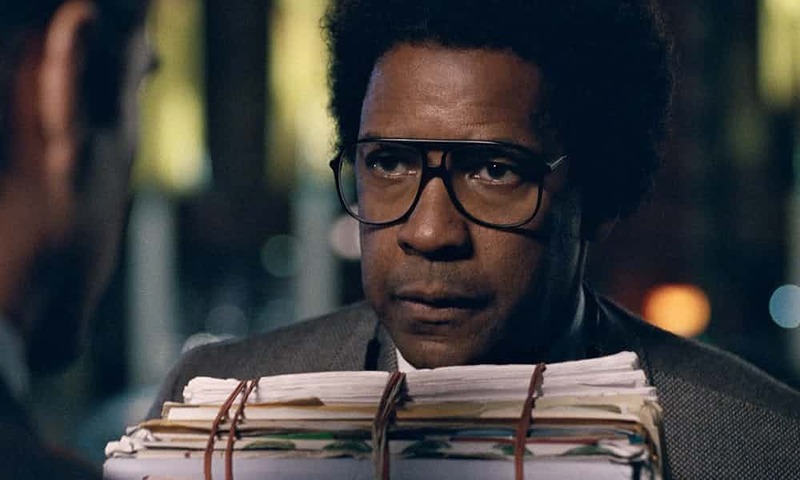 ROMAN J ISRAEL ESQ has a running time of 122 minutes and is rated PG-13 in the USA and 12A in the UK for infrequent strong language and moderate violence. The movie played Toronto 2017 and opened last year in the USA and Canada. It opened earlier this month in Malaysia, Estonia and Poland. It opens in the UK and Ireland on February 2nd, in Spain on February 9th, in Argentina on March 1st and in Germany on April 19th.